Don't worry. Be happy. Keep learning. : Fall Wreath. When I have a lot on my mind, I need to make myself busy. 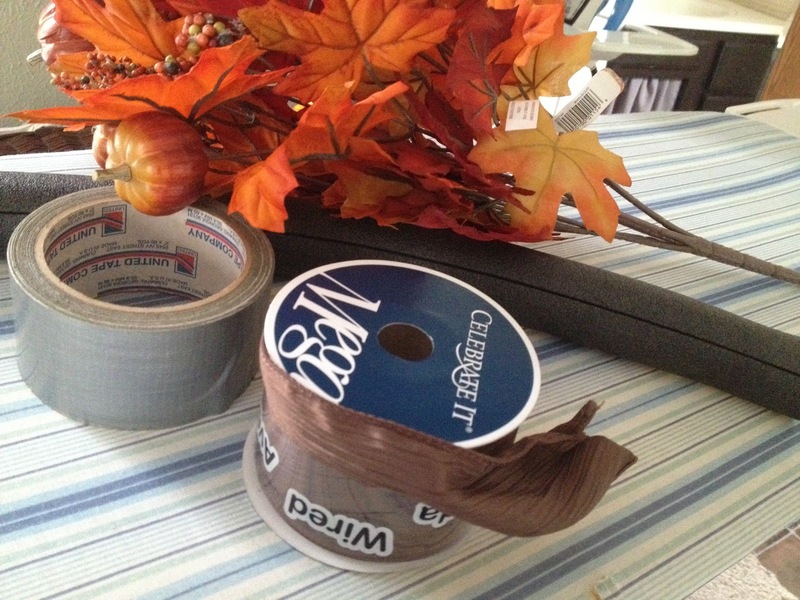 I've had about 10 crafts in the works either literally (unfinished) or in my head still as an idea. 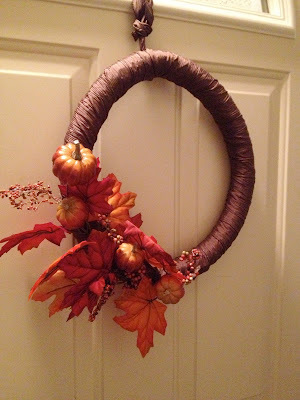 Last night was one of those nights I needed to DO SOMETHING to keep my mind occupied, and a good time to complete a wreath I've been thinking about since, well, last Fall. 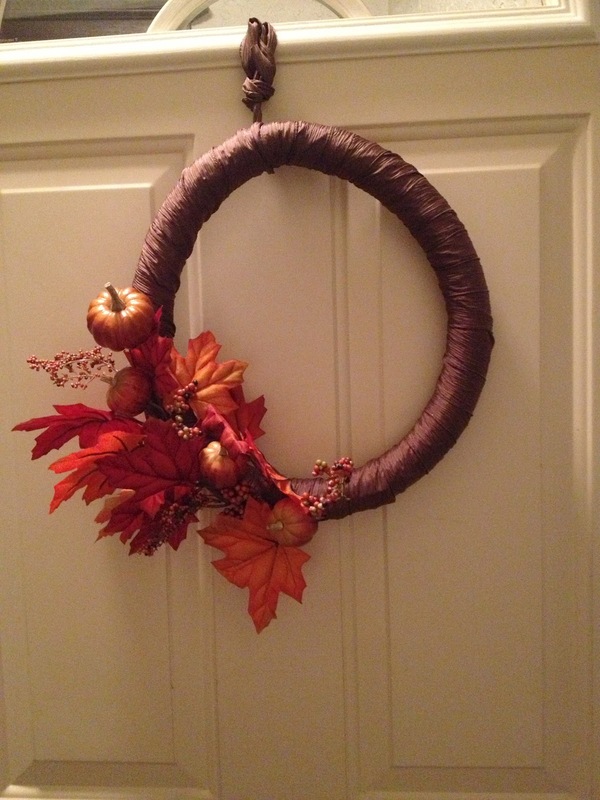 Until now, I've had the same Fall wreath for about 10 years. I bought it at Pier 1 and it was one of the first things I purchased when I got a job there in college. It was adorable and had a little scarecrow sitting on a bunch of twigs wrapped in a circle. He's been through a handful of moves and every year I bust him out of the bin to discover he's missing another piece. One year, he lost a patch on his pants, the next his nose was gone, then one year I couldn't find the button that was his eye. Yes, he's a scarecrow and missing pieces is "charming" but after a while, a faceless, patch-less scarecrow is just a male doll sitting on a wreath. Creepy. So this year I combined my need for a new wreath with my stress and frustration, plus some cheap craft supplies and about 20 minutes of free time. I first duct taped the foam insulator tube thing's ends together to form a circle. It's way cheaper (50 cents for the foam insulator tube thing plus duct tape) to do this instead of buying the foam rings at a craft store for $10+ so the choice was obvious. 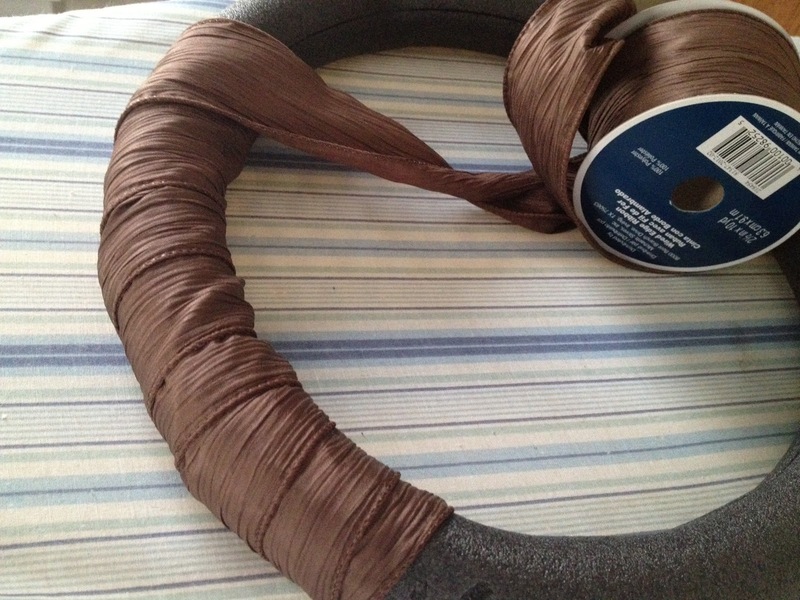 Next I wrapped the tube with the wire ribbon. 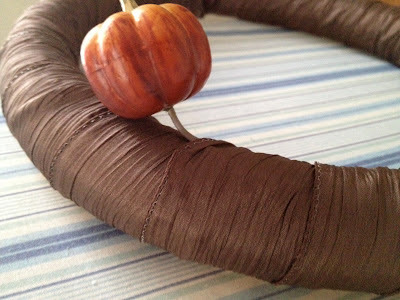 I used no glue or pins for this because the wire ribbon has wires on the edges. 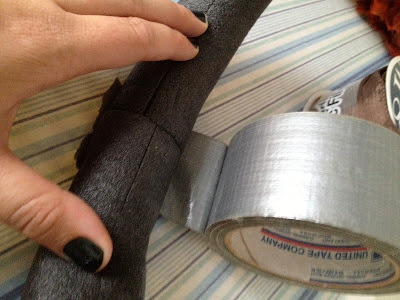 I poked them into the foam insulator tube thing to secure, then covered it up and kept wrapping. Then I made a simple tie to finish it off. Again the wiring is nice and helps it stay in place. 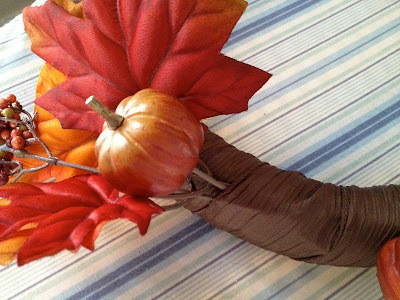 I started clipping stems from the fall floral bundle and tucking them into the wraps of the ribbon. 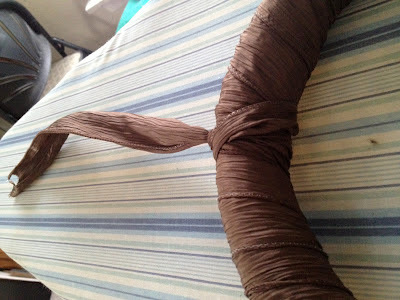 Again, no glue, because the ribbon was tightly wrapped so it made for a snug fit. I kept tucking stems until I liked what I saw. And I like what I see now. This took barely any time, and it'll do until I get a better scarecrow wreath next year. at 3:36 PM Topics: Blog., Crafts., DIY.